A recent search for information on global warming returned a prominent ad for a site that rejects established climate science. 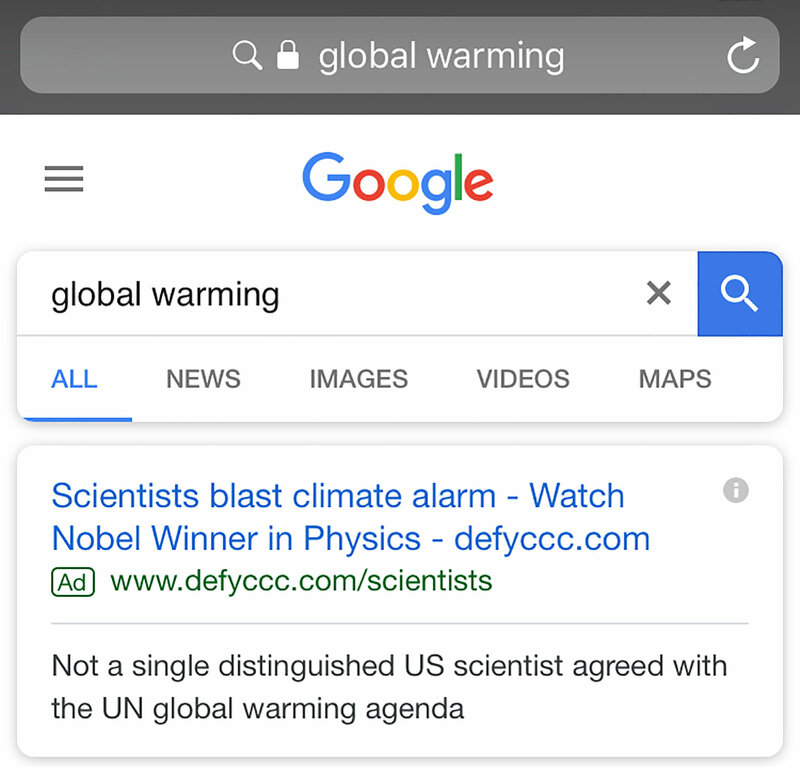 Type the words “climate change” into Google and you could get an unexpected result: advertisements that call global warming a hoax. Another ad proclaimed: “The Global Warming Hoax — Why the Science Isn’t Settled,” linking to a video containing unsupported assertions, including that there is no correlation between rising levels of greenhouse gases and higher global temperatures. America’s technology giants have come under fire for their role in the spread of fake news during the 2016 presidential campaign, prompting promises from Google and others to crack down on sites that spread disinformation. Less scrutinized has been the way tech companies continue to provide a mass platform for the most extreme sites among those that use false or misleading science to reject the overwhelming scientific consensus on climate change. Google’s search page has become an especially contentious battleground between those who seek to educate the public on the established climate science and those who reject it. Not everyone who uses Google will see climate denial ads in their search results. Google’s algorithms use search history and other data to tailor ads to the individual, something that is helping to create a highly partisan internet. A recent search for “climate change” or “global warming” from a Google account linked to a New York Times climate reporter did not return any denial ads. The top results were ads from environmental groups like the Natural Resources Defense Council and the Environmental Defense Fund. But when the same reporter searched for those terms using private browsing mode, which helps mask identity information from Google’s algorithms, the ad for DefyCCC popped up. After being contacted by The New York Times in mid-December, Google said it had removed an ad from its climate search results, though it declined to identify which one. An ad from DefyCCC was still turning up at the top of searches days later. As of Wednesday, no ads at all were turning up for Times reporters and editors running these searches. The climate denialist ads are an example of how contrarian groups can use the internet’s largest automated advertising systems to their advantage, gaming the system to find a mass platform for false or misleading claims. Google allows companies to bid on search terms, and displays paid content at the top of its search results in the same blue font used for unpaid content. (For example, a candy maker might bid on the term “Christmas candy” so that its ads pop up when someone searches for those words.) Google identifies ads in its search results with an icon below the link. “We have extensive policies that protect users, advertisers and publishers from harmful, misleading, and deceptive content,” a Google spokeswoman, Elisa Greene, said in a statement. She said that last year the company had removed 1.7 billion ads and 100,000 publishers for policy violations in its ad network. Google’s AdWords policy on misrepresentation states that it does not want users “to feel misled by ads that we deliver, so we strive to be clear and honest, and provide the information that users need to make informed decisions.” But that policy focuses on consumer protection — for example, guarding against concealed subscription or shipping costs — not on the veracity of other content. Many media organizations have come under fire for giving a platform to climate change denialists in the interest of balance, and policies on paid advertiesments vary. The climate denial ads on Google come amid a wider effort — backed by wealthy conservatives, fossil fuel companies and right-wing think tanks — to discredit the prevailing science on global warming and to prevent action. DefyCCC, the site that recently bought the “climate change” search term on Google, devotes an entire section of its site to content from WattsUpWithThat, a well-known climate denial site by the blogger Anthony Watts. Mr. Watts has received funding from the Heartland Institute, backed by the billionaire Koch brothers. Beyond that, little is known about DefyCCC. Its domain was registered through DomainsByProxy, a service that allows owners to keep their personal information secret. He said he aimed to combat what he saw as alarmism over science that he argued was not settled. He received help with his site but would not say who his backers were to protect their privacy. “I can tell you it’s not the fossil fuel industry,” he said. He said that advertising on Google had dramatically increased his site’s visitor numbers. Traffic to DefyCCC has surged almost 2,000 percent over the past six months, with much of the increase since late September, according to data from web analytics firm SimilarWeb. The proliferation of climate disinformation, both online and off, has coincided with an effort to undermine measures to combat climate change. Republican leaders regularly question climate science and President Trump has called climate change a hoax. He announced plans to withdraw from the global Paris accord on climate change and is aggressively rolling back environmental regulations. Fewer than a third of registered Republicans nationwide say that climate change is caused mostly by human activities, according to a new study published in the journal Climatic Change by researchers at the University of California Santa Barbara, Yale University and Utah State University. 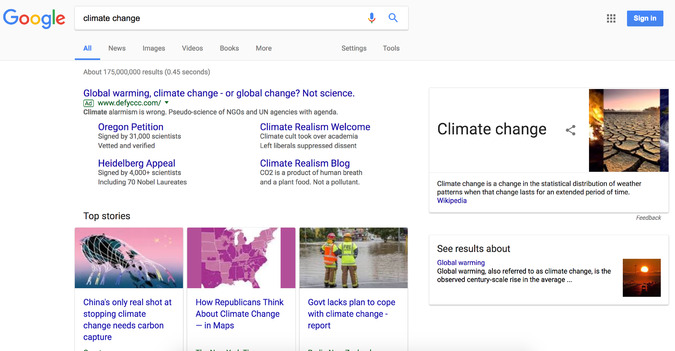 The Natural Resources Defense Council buys Google search terms as “a tool we use to help connect with people who want to get informed and get involved in the fight against climate change,” said Margie Kelly, a spokeswoman for the environmental group. The Environmental Defense Fund did not respond to requests for comment. Jeffrey Harvey, a population ecologist at the Netherlands Institute of Ecology, recently published a study on blogs that deny the well-documented impacts of climate change and Arctic ice loss on polar bears. He said that contrarian ads on web search results, which many users considered to be neutral territory, were especially problematic. 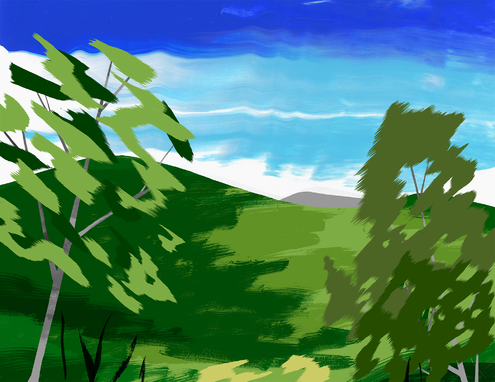 An earlier version of this article gave an incorrect name for an environmental group that has purchased ads on Google. It is the Natural Resources Defense Council, not the National Resources Defense Council.